Beleaguered Bury travel to Kingsmeadow knowing that another defeat would push them even closer to the League Two trap-door and those fears are likely to be realised when they take on AFC Wimbledon. The Shakers enjoyed a mini-resurgence at the turn of the year, however a lack of firepower could lost them again when they visit the capital. Second-placed Scunthorpe and south-west side Torquay complete our ‘fourth division’ treble with a £10 stake returning a very tempting £101.25. Neither of these sides have been particularly impressive of late but we’re plumping for Neal Ardley’s Wimbledon here, buoyed by the recent on-loan signing of Scunthorpe captain Michael Collins. The former Republic of Ireland U21 international could provide the necessary guile to unlock the Bury defence and halt a run of three straight defeats. 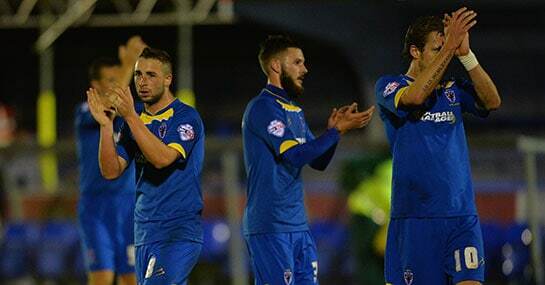 Home comforts have been key for the Dons with seven of their 10 league victories this season coming at Kingsmeadow. And with the visitors losing seven of their 13 games on the road the Londoners can be confident of taking all three points. Having scored just two goals in their last five matches it’s clear to see why David Flitcroft’s men are hovering above the relegation zone and their plight is unlikely to be eased this weekend. The Iron will probably be many punters’ banker selection as they bid to reel in table-toppers Chesterfield. Scunny are protecting a 15-match unbeaten run stretching back to their FA Cup defeat to rivals Grimsby in November as they prepare to face a Portsmouth side treading water in mid-table. The hosts were 2-1 winners in the reverse fixture at Fratton Park and recently re-discovered the winning habit with victory over Accrington following a series of five successive draws. That could be ominous for Pompey who haven’t travelled well this term, winning just two of 15 league matches away from home. Accrington make the long trip to Torquay bidding to further distance themselves from the relegation dogfight but their run of good form could be about to come to an abrupt end. Gulls boss Chris Hargreaves saw his side put in a gutsy display against Chesterfield last time out and despite their 3-1 defeat the strugglers can still glean plenty of positives. The hosts’ recent record at home to James Beattie’s Stanley is also noteworthy having gone undefeated in their last four when entertaining Accrington, winning three of those encounters. If that trend continues then Torquay can extend the visitor’s winless run to four games and take a giant leap to securing their Football League survival.